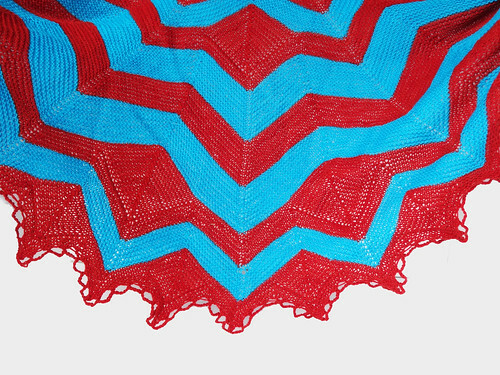 Mayura by CrystalRose is an unusual shawl that I loved knitting, despite a few hiccups. It's so different from the usual semi-circular shawls that are available and I knew it would look great with the yarn I had. The yarn I had was Wollmeise Pure in the colours, Turkis (the blue) and Sanguinella (the dark orange). Oh, how I love this yarn. It's soft and bouncy and beautifully colourful. It's a sock weight yarn in 100% superwash merino and each skein is 150g, 525m in length. They are very generous skeins. I had originally decided to add these two skeins to one I already had in stash, and make up a stole in three colours. Then I saw the above photo for this pattern and knew it was too much of a coincidence to pass over the match in colour choice. 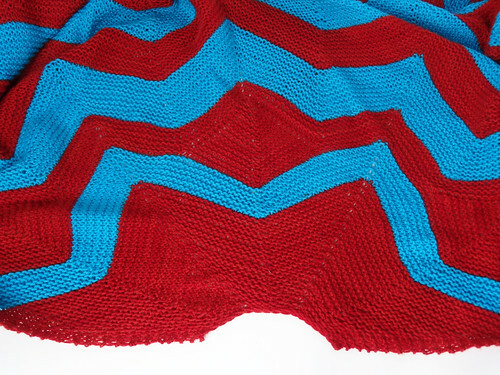 The pattern is written to be either knit with the main colour being done in either stocking stitch or garter stitch. I love garter stitch shawls so that made the decision for me. I really liked the the shape of the start of this top down shawl, with the nice curve to sit around the back of the neck. I would like to say that you should watch out for the colours the pattern assigned to the main colour and the contrast colour. The contrast colour is the one that actually uses the most amount of yarn, in this case the Sanguinella (orange). I ended up going wrong by mixing up the colours I should have been knitting and had to rip back around 12 rows, which frustrated me a little. 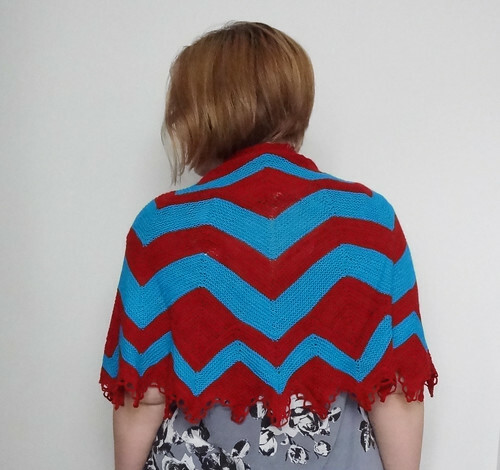 The pattern uses mitred squares to add to the chevron shaping and to perform increases in a very clever way. I really like the shape it gives the stripes of colour. When knitting the mitred squares, I decided to change the way I picked up the edges to attach the squares to the body of the shawl. 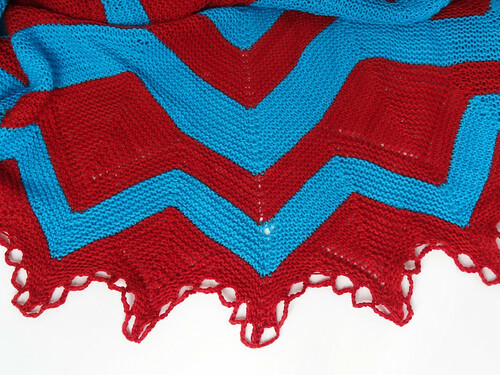 You pick up one of the bottom edges on the right side and the other bottom edge on the wrong side of the shawl. In the pattern you pick up and knit on both sides of the shawl, instead I picked up and knit on the right side and picked up and purled on the wrong side. This meant both the ridges of picked up stitches were on the wrong side of the fabric. 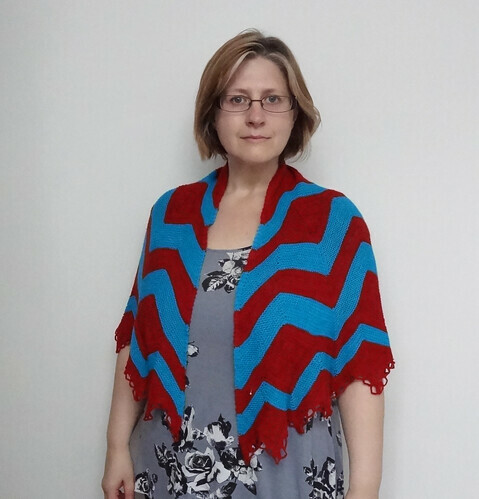 The front of the shawl looks like the photo below. 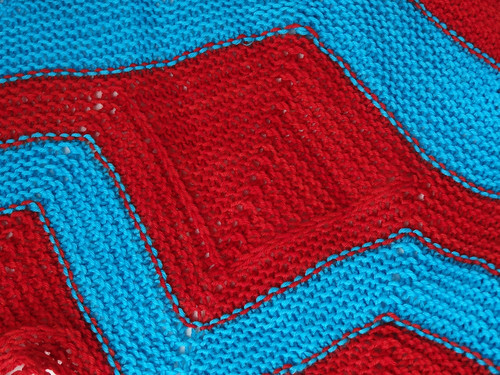 You can see what the picked up stitches ridges look like on the wrong side of the shawl, below. I'm glad that I kept the appearance of the edges of the mitred squares balanced and hidden. 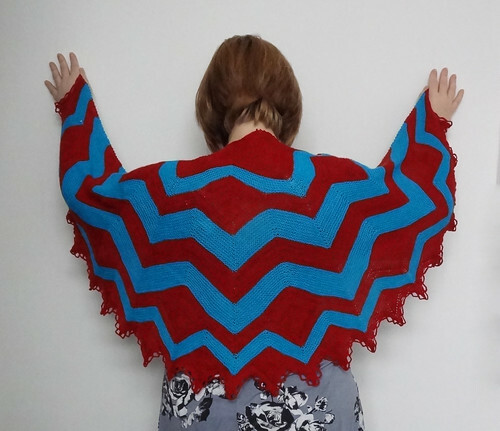 The way the shawl is structured meant that there were sections that were mindless knitting, livened up by the chevrons and the colour changes. This is interspersed by the interesting sections of the mitred squares. It was a great shawl for reading whilst knitting for long sections and then it was thinking knitting for a time. It made for a nice balanced knit. The bind off is crocheted. I would recommend removing the stitch markers on the row before the bind off. As it was not specified on the pattern what size crochet hook to use, I decided to use a 3mm hook. Using this size, I was struggling to get the hook into the stitches on the needle, so I swapped out the needle tip to a 2.75mm. 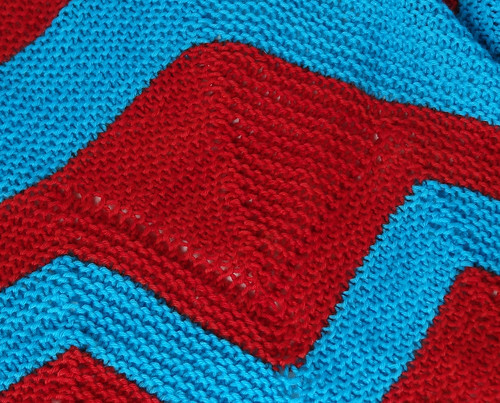 For information, I used a 3.5mm needle to knit the pattern, which was the one recommended. Now this is blocked, I can say with confidence, if I ever cast on a project that uses a chained bind off, someone remind me that blocking it nearly killed me. It took a gazillion pins and far too long hunched over the blocking boards. Not fun, but it had to be finished once started. It was worth all the effort though because it made the shawl look great, now it is blocked properly. There were several errors in this pattern that I had to tell the designer about and there were a few places where there could have been clearer instructions. I think this was because it was a complicated concept and there have been so few people who have knitted this so far. I think I was the first person other than the designer and the test knitters to make this shawl. I think in the future I might try to avoid patterns with so few finished projects, because I prefer someone else find out all the errors, before I have to. Still, I can't help but be really happy with the finished shawl. It hits me right where I want, just below my elbows so I'm kept nicely wrapped up. With a shawl pin, it's almost a poncho! It gives a nice level of coverage, being sock weight knit in garter stitch. It's light, but has a little more warmth than a stocking stitch shawl. I think it will be perfect for cooler weather and for wearing indoors in Winter as an extra layer instead of a cardigan. 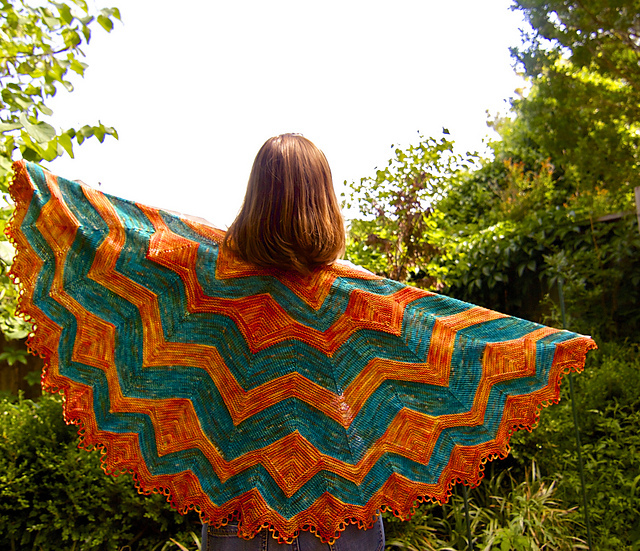 Despite the errors, this shawl can't help but make me smile, with it's lovely yarn, vivid colours and fun design. But I'm still never using a crochet bind off EVER again! PS writing this post has made me want more Wollmeise, so I have just been to buy some more to replace the yarn I've just used. That's really not helping me use all my stash up!